I’ve lived here in southwestern Virginia for a little over a year now (August 15 was my 1 year Roanokiversary). It’s a little strange to think that for over a year now my car has been registered in the Commonwealth, I’ve lived in two different homes that are not in Atlanta, and, especially, that I’m really only a few months away from graduating with a Masters in Fine Arts. When did all this happen? Given that it’s my first Vegan MoFo not in Atlanta, I’ve decided to give into some homesickness I’ve been having (I think the cold weather brought it on) and, on every Friday this month, post about a restaurant I love love love in the city that I love love love. A mental roadtrip, if you will. So here’s the first installment! Let’s talk tacos for a minute–giant, vegan, BBQ tofu tacos, to be exact. And let’s talk quirky, a-little-too-touristy-now-but-still-fun areas–Little Five Points, in this case. What do you get when you combine the two? Ely Myr! El Myr is one of my first stops for food when I get to Atlanta; I really know I’m home once I have one of their tacos and a margarita in my hands. The place itself is cool and quirky with street art murals all over the walls, dark stains in corners from too many nights of people boozing and smoking and doing who knows what else (not that I would know anything about those nights…no…), a large screened-in patio to the side, and the clanging of pots in the kitchen. It’s grunge and punk and hipster and everything else Little Five Points has become (though, thankfully, not too overrun with suburban kids since it’s a little of the main drag, down Euclid Ave.). I’ve spent many a meal and many a night at El Myr, the meals sometimes turning into nights depending on how many Dark & Stormys we drank, and it’s definitely one of my go-to restaurants in the city. What about the food though? Ever since learning about the once not-on-the-menu BBQ Tofu Taco (it’s now on there, I think), I haven’t ordered anything else. Pretty much any taco/burrito on the menu can be made vegan–just opt out of cheese or sour cream and get veggies or tofu or beans for the protein. The BBQ Tofu Taco, though, is out of this world. I’m a sucker for BBQ sauce, but I wouldn’t normally put it on tacos. But the combo of tangy sauce with creamy guacamole, crunchy lettuce, and fresh tomatoes is so so good. And you really only need the taco, if you’re like me, since it’s the size of a normal burrito. The burrito is freaky huge. Oh, and if you like heat, get the green salsa over the red–it’s firey, but in a good way, in a DAMN-that-taco’s-good kind of way. Oh, I love seeing restaurant posts – I really do use them to decide where to go when traveling. This looks like a great place. I love having good food that’s worth coming home for. Am I wearing my 3D glasses? 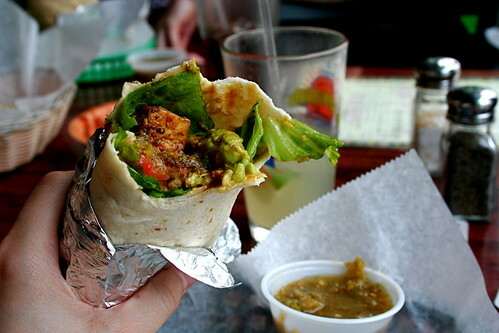 This picture looks like it pops up and the burrito is coming straight at my face! I like living vicariously through people that eat out. BBQ tofu tacos sounds really yummy! I definitely have to try making something like that. I’ve been living in Charlotte for almost 5 years now, and believe it or not I still get homesick at times. I was born and raised in NJ and unfortunately I don’t get to go back there too often. I know where I’ll go eat if I ever visit Atlanta! Looks so yummy. I’m all about missing delicious foods I can’t get where I’m living. Helps me feel the need to create and re-create them! Thank you for posting about Elmyr. I hadn’t heard of it, and we go to Atlanta fairly regularly, as it is about 3 hours away. There is a vegan baker there that I’ve been keeping an eye on, because they kept saying they were opening an actual shop. It hasn’t happened yet that I know of, but I’m still watching their blog! OMG! The BBQ Tofu taco looks awesome! That thing is huge! I just may have to try making a version at home, it looks so good. Also, El Myr delivers now!!! On bike, so the area is small, but it’s pretty rad that you can get guac and a BBQ tofu burrito delivered right to the door! Or maybe a green burrito? God, I love El Myr.